Mum warned me my relationship was dangerous, but I was besotted. Trigger warning: This post deals with domestic violence. As I slipped on another pair of over-sized, daggy trackie pants, I swayed my hips from side to side. "How do they look?" I asked my boyfriend, Brae. "Everything looks gorgeous on you," he replied. We were both sweet 16 and had known each other for years. We'd just started dating, but I was already besotted with Brae. He felt the same and loved spoiling me with gifts, especially clothes. His fashion sense was shocking, but he was kind and cute. I didn't have the heart to tell him I looked like a granny dressed in the garments he'd bought me. We were always giggling and having fun together, until one day I put a smiley face on a text message I was sending a male friend and Brae flipped. "You like him, don't you?" he snapped. "You're cheating on me!" Unleashing an ugly temper he threw my phone to the floor, smashing it into smithereens. As quickly as he snapped, he simmered down and, afterwards, replaced the phone. But I couldn't get over the shock. I'd never seen that side of Brae before. My sweet and caring guy was an insanely jealous monster! I thought Brae was the love of my life. It wasn't the last time I saw that side of him either. After that, the cruel verbal abuse became a regular occurrence. "You look cheap," he'd sneer whenever I made an effort to dress up. I stopped wearing make-up after that. I just wanted Brae to love me but everything I did seemed to send him into an uncontrollable rage. One afternoon I was chatting to a friend and her boyfriend in the local park. When Brae arrived, he lost it. "Who's he?" he roared, slapping me across the face and storming off. My friends stood there speechless, as I ran after Brae to calm him down. Then he rained punches all over my body, bashing me in the ribs so hard I could barely breathe. I was convinced I could change him, make him swear he wouldn't hurt me again, so didn't I tell the police. Instead, when I next saw my mum, Mel, who lived interstate, I confessed to her, and made her promise not to say anything. "You need to get out of this relationship, love," she said, wrapping her protective arms around me. "It'll get worse and end badly." Yet when Brae came back, tail between his legs, I gave him another chance. "Move into Mum's place with me?" he asked. We'd been together seven months and as soon as I'd unpacked my bags, Brae banned me from seeing my family and friends. Then he took my bank card and withdrew money from my account. I was rushed to hospital and went into a coma. The daggy clothes, controlling my finances, looking after my phone, keeping me away from everyone… He wanted me all to himself. Brae wanted to own me. Brainwashed and blinded by what I thought was love, I still didn't leave. I just wanted my battered and bruised body to be loved back. One day, I was picking up the clothes Brae had thrown to the floor during an argument, when he hurled a jerry can at me. The cold liquid splashed on me. "I should burn you," he threatened as the liquid sloshed over me. Surely he wouldn't, I prayed, cowering away from him. Thankfully, I was right and he let it go. Shortly after, we were at Brae's mum's place when he decided to strip the paint off his car and respray it. "Can I have my phone?" I asked as he worked. "Go away or I'll set you on fire," he threatened again. His eyes glinted with hatred as he picked up a bottle of liquid and threw it over me. "Don't do this," I pleaded as it splattered my arms and chest. Orange flames erupted over my body and licked at my face. Burning air singed my lungs as I shrieked in agony, breathing in the white-hot flames. I was a human fireball. I fell to the ground and rolled on the grass, howling like an injured animal. Brae had bailed, leaving me for dead. The smell of burnt flesh made me sick as I ripped off my shirt and shreds of charred skin peeled from my arms. Neighbours came rushing over and got me under a cool shower. When the ambulance arrived, paramedics gave me pain relief before rushing me to hospital. I woke in Royal Brisbane Hospital and Mum, my grandma and little sister, Tayla, were beside me in tears. "You've been in a coma for 24 hours, love," Mum whispered. Later, I told police what had happened and they said Brae had been arrested. Suddenly, it hit me… the love of my life had set me on fire. I broke down – it was such an evil act. How could he? I'd suffered hideous burns to my hands, arms, face, neck, chest and thighs. For weeks I was swaddled in bandages. When I finally looked in the mirror, I was unrecognisable. 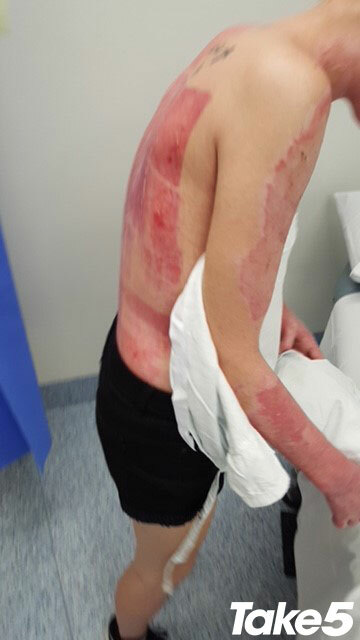 Even after three skin grafts, my flesh was covered in red thick, snaky scars. After a month, I was allowed home with Mum, but I still struggled to cope. I wasn't surprised when strangers stared. I felt like a freak. I stopped looking in mirrors and rarely ventured out. My scars remind me that I'm a survivor. I want other girls to know they can be too. It took all my strength and determination to give evidence against Brae at Beenleigh District Court. He sat with his head down – too cowardly to look at me. After just two hours the jury found Brae Taylor Lewis guilty of a malicious act with intent to cause grievous bodily harm and sentenced to 11 years. "It's over," I wept to Mum. "I need to try and move on." But after five years, that's easier said than done. I'm being treated for depression and still struggle to look in the mirror. But Brae has not beaten me. I can't change my past, but I can change the fate of other vulnerable young girls. I want my story to be a warning of what can happen if you stay in abusive relationships. Please get out before it's too late. Everyone deserves to be treated with love and respect and no-one should live in fear. I'll forever bear my scars, but they're a reminder that I'm a survivor and I can get through anything.